As urban agriculture becomes an increasingly important issue for cities like Udaipur, India, community gardens can be one tool for securing residents’ access to food. Photo by Didi/Flickr. In the northern hemisphere, the days are growing longer and warmer, signaling the first day of spring. For many, it’s time to start sowing seeds, and for those in cities, it’s time to dig into community gardens. 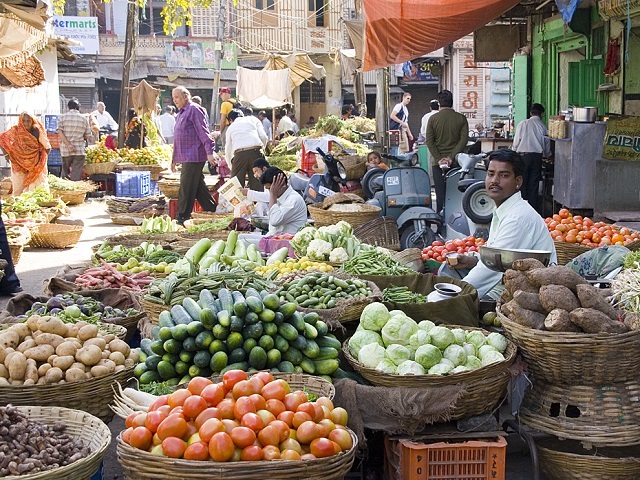 According to the US Department of Agriculture (USDA), around 15 percent of the world’s food is now grown in urban areas. In the developing world, urban residents have long had to grow food or tend livestock for extra food security, but in recent years urban farming has become more practical for many income groups in cities around the world. Urban agriculture enhances sustainability, secures public space, and provides much needed food security and health benefits for communities. Whether in backyards, on rooftops, on balconies, or in vacant lots, ingenuity in urban agriculture yields abundant solutions for those who put in the effort. While many of China’s booming metropolises are sprawling over land with new buildings and construction, some people have taken to the roofs. In the southwestern city of Chongqing, employees at a door-making factory have cultivated a 10,000 square meter rooftop farm, complete with crops, poultry, livestock, and a tractor. This functional green roof has improved the quality of life of the employees who voluntarily tend the farm, providing them with fresh fruits and vegetables. In Beijing and Hong Kong, two urbanites have received attention for their farming exploits. One man has experimented with inventing fertilizers, eventually yielding a good harvest in his second season. Another man invites his neighbors to rent boxes while providing soil, seasonal seeds, tools, and the opportunity to garden themselves so that they can spread information about this new initiative with the community. India has about 93 million slum dwellers, and as much as 50 percent of New Delhi’s population and 60 percent of Mumbai’s are estimated to live in these informal settlements. Residents in the dense slum of Ambedkar Nagar in Mumbai recently converted a dumpsite into a community garden. Formerly, the waste had become as high as a two-story building, propagating diseases and threatening the nearby Mithi River and residential water pipeline. With help from local organizations, the community mobilized to clean the area and raise awareness of waste management and composting. In addition to greatly improving public health and containing waste, the site is now covered in greenery and attracts butterflies rather than flies. When event halls are too costly, families have even turned to the garden as a wedding venue. In some Indian cities, the majority of residents live in densely packed residential areas. 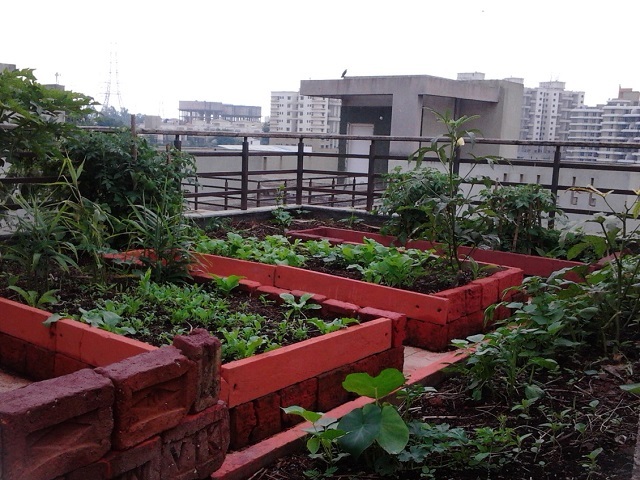 Siddartha Sikdar’s organic farm on his terrace in Pune, India, for example, makes efficient use of private space to expand food access. Photo by Siddartha Sikdar/Flickr. 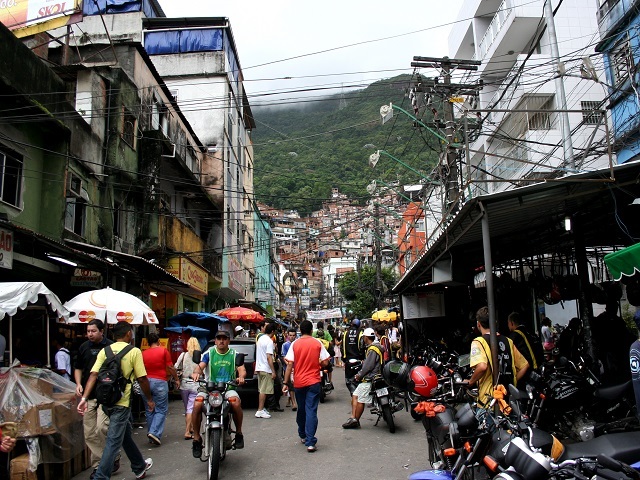 In Rio de Janeiro, about 22 percent of the population resides in favelas. An important part of the city’s Morar Carioca favela improvement program is to foster community garden development in communities like Babilônia and Chapéu Mangueira. Early during the program in 2012, 16 residents volunteered for a five-month training program to learn household planting and growing techniques, which gave them homegrown organic produce as well as new skills that could be shared with their neighbors. Additionally, through organizations like Green My Favela, the city is reclaiming degraded land to build green spaces, securing nutrition, and sharing skills with a variety of participants and collaborators. In São Paulo, Cidades Sem Fome (“Cities Without Hunger”) works to develop community gardens, school gardens, agricultural greenhouses, and small family farms. The organization focuses on the east side of the city, which contains 33 percent of the city’s population and is home to about 40 percent of the city’s unemployed residents. The organization’s first initiative, the Community Gardens Project, has started 21 community gardens, trained 115 community gardeners, and organized 48 professional qualification courses. Underserved communities, like Favela de Rocinha in Rio de Janeiro, are benefiting from urban gardening programs to educate residents about health and equip them with agricultural skills. Photo by Scott Hadfield/Flickr. By 2050, 70 percent of the world’s population will live in cities, leading to a higher demand for food and a smaller supply of rural residents producing it. Urban agriculture may increasingly become a “strategy of emancipation” for food security and improved quality of life in cities. The environmental, health, and economic benefits of community gardens are many, and the innovative solutions from places like Beijing, Mumbai, and Rio may soon become the mainstream in cities around the world.